Return of the Robin, or not? Will Spring EVER get here?! And exactly how do we know it’s actually arrived? For most of us, stepping out the door waiting for that warmer blast of air to grace our face, or listening to weather reports promising warmer weather don’t often work for us. It’s not always reliable. Most of us here in the southern Ontario region, however, say that the return of spring is only when we notice that the Robins have returned. But actually, the Robins never really left. They just change their behavior in the winter so we don’t notice them as much. Robins eat worms, but they also eat lots of other things, too like insects, grubs, and even snails. We tend to notice them around our gardens because they hunt for these things on the ground. But they also eat fruit, which they search for in trees and shrubs, which is not where we’re used to seeing them. When winter comes, the worms and insects aren’t as available to them, so during the cold months their diet consists mostly of fruit. You may not see them in your garden, so you think they’ve gone away, but they are year round residents in our area. 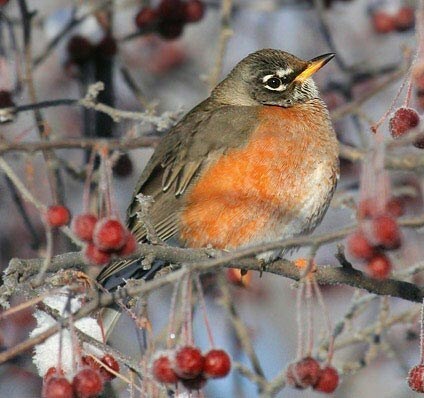 During the winter months Robins gather together into huge flocks, sometimes numbering hundreds or even thousands of birds. And they fly around in these flocks in search of fruit. When they find it, the whole flock will descend and strip every berry from the trees and shrubs that they find, often in a single afternoon. Plan now to add fruiting and berrying native shrubs and trees to your garden so you can welcome the Robin to your winter home next year. Good choices include: American Holly (Ilex opaca), Eastern Red Cedar (Juniperus virginiana), Cranberry Viburnum (Viburnum trilobum), and Winterberry (Ilex verticillata).